Language Corner: the company that provides language courses to students. Student: a person who is taking one or more language courses at Language Corner. The Agreement: the agreement between Language Corner and the Student where Language Corner delivers language courses to the student, for which courses the Student will pay Language Corner a fee per selected course. Course: one language course, consisting of several lessons. A course can be a Group Course or a Private Course. These terms and conditions apply to any offer or agreement from Language Corner and the Student and represent the entire agreement between Language Corner and the Student. In case of conflicting provisions, the provisions in the Agreement will prevail. Other terms and conditions are not valid in any way. The Agreement becomes valid when the Student has accepted the offer of Language Corner. If the Student has accepted the offer via the website of Language Corner, Language Corner shall conform to the Student that the offer is accepted. As long as the acceptance of the offer is not confirmed by Language Corner, the Agreement is not final. Language Corner may, within the limits of the law, gather information about the Student’s ability to fulfil the payment obligations. If Language Corner, based on the information gathered, has reasons to believe that the Student is not capable or willing to fulfil the payment, Language Corner is entitled to cancel the Agreement. A Course starts on the day which is mentioned in the Agreement, or – in the case that there is no specific day mentioned – at the first day on which the Student is schedule for the Course. Language Corner may postpone a Course or a lesson until 24 hours before the Course or the lesson starts. If the Student is – because of the rescheduling – not able to attend the whole Course, or the rescheduled lesson, the Student will be given the opportunity to follow the Course or lesson at another date. 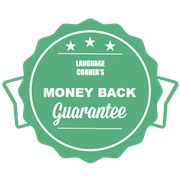 If the Student is not able to attend the Course or lesson on another date, Language Corner will give a refund for this Course or lesson to the Student. In case the Course or a lesson has to be rescheduled because of sickness or other circumstances which are beyond reasonable control of Language Corner, the Course or lesson may be cancelled and/or rescheduled at any time. The Group Courses are divided in different proficiency levels. Students may need to participate to an assessment to determine the desired level of the selected Course. Admittance to the Course the Student has applied for may depend on the results of the assessment. During the Course, a Student may request to be transferred to another proficiency level when shown he or she has the capability to participate in the other level and when the desired Course has the capacity for an extra Student. The Student will receive a Certificate of Participation and Completion (the Certificate) when he or she has successfully completed a Group Course. A Group Course is successfully completed when the Student attended at least 75% of the lessons. In case a Group Course consists of different parts, Students will only receive a Certificate when the student has attended at least 75% of each part of the Group Course. Courses take place at the location mentioned in the Agreement. Language Corner however has the right to change the location of the Courses when necessary. Courses may take place during public holidays. All course dates are communicated on the website at least 14 days prior the starting date of the Course. Students who applied for a Group Course may request to be rescheduled for the whole course. The request has to be made at least 7 days prior to the start of the first lesson of the Course. In case of rescheduling, Language Corner can only reschedule the student for the Course for one of the other scheduled starting dates in the same year. In the case the Student applied for a Private Course, the Student may reschedule a lesson by consulting his or her teacher, with a maximum of two rescheduling moments. The request has to be made at least 24 hours prior to the start of the lesson. In the case of a Private Course, the request for another teacher should be made in writing and based on reasonable grounds. If Language Corner agrees to the request of the Student but there is no other teacher available, the Student will get a refund for the remaining hours of the Course, minus € 50,00 for administration costs. In case the student is not satisfied about the Group Course, the Student must submit a refund request before the third lesson of the Student’s registered Course. The refund request must be submitted within five days after completion of the second lesson. A money refund will only be given when the Student did attend the first two lessons in full. The money back guarantee does not apply to private lessons. Language Corner may dismiss any Student from a Course or lesson due to misbehaviour or inappropriate behaviour of the Student. In case a Student is dismissed because of misbehaviour or inappropriate behaving, the Student is not entitled to get a refund for the missed Course and/or lessons. All prices are in EURO’s and are exempt from VAT. Language Corner cannot be held responsible for typos in the mentioned prices. The fees for the Courses will be invoiced prior to the start of the Course. The invoice has to be paid ultimately on the day before the Course starts. When, on the starting day of the Course, the invoice has not been paid, Language Corner may refuse the Student to participate in the Course. The Student will have a permanent place at the Course when the course fee has been paid. The Student may cancel the Agreement up to fourteen days before the day the Course starts. Cancellation of the Agreement (or part of the Agreement) must be by written notice to Language Corner and must be received by Language Corner at least fourteen days before the starting day of the course. In that case the Student is entitled to a full refund of the course fee. When the Agreement is cancelled by the Student on a shorter term than fourteen days but longer than seven days before the starting day of the course, the Student is entitled to a 50% refund of the course fee. When the Agreement is cancelled by the Student on a period of notice shorter than seven days, the Student must pay 100% of the course fee. The Student’s inability to attend a lesson (or the entire course) is at the Student’s risk. The Student is not entitled to a refund of (a part of) the course fee. If a Private Course is cancelled by the Student and restitution of the course fee is applicable, Language Corner will charge the Student € 50,00 for administration costs. Complaints about the content of the full Course, a lesson or the teacher should be made within 14 days after the specific lesson or Course has taken place, or within 14 days after the teacher’s behaviour where the complaint is based on. Complaints should be made in writing, by e-mail or post, and must be well-motivated. Language Corner will respond within 14 days after the receival of the complaint. Should a complaint require a foreseeable longer time for handling, Language Corner will respond within 14 days with a notice of receipt and an indication when the Student can expect a substantive response. The Student has given permission to process personal data. Providing relevant information to the Student. The Student has the right to inspect, change, delete or transfer his or her personal data as well as the right to information. Language Corner may take photos and videos of the students for the use of promotional material such as flyers, posters, images for the website, brochures and films, unless the student explicitly requested not to do so. Language Corner owns all intellectual property of all photos and videos mentioned in the first paragraph of this article. Language Corner also owns all intellectual property of everything which is published on her website, hand-outs, and all work, in hand out or digital, shown to the Company and/or the Students. Language Corner is not liable for damages or the loss of any property of the students. Language Corner cannot guarantee that the Course which the Student is taking, is fit for the purposes of the Student. The Agreement and these terms and conditions are exclusively governed by Dutch Law. Any disputes which may arise from the Agreement and/or these terms and conditions will be exclusively submitted to the competent judge at the court of Amsterdam, the Netherlands.